Terry Foley of Catholic Charities. ABC11 Together highlights the strength of human spirit, good deeds, community needs, and how our viewers can help. WAKE COUNTY (WTVD) -- Today is known as "Giving Tuesday," a day meant to inspire you to give into the holiday spirit by giving to charity. 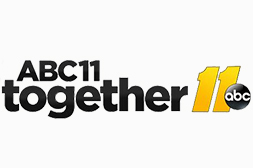 ABC11 is teamed up with the Food Bank of Central & Eastern North Carolina for our annual ABC11 Together Food Drive, and for today only your donations are being matched dollar for dollar. Catholic Parish Outreach is a partner organization that helps distribute food from the food bank. It's one of over 800 partner organizations the Food bank provides food to. "It's helping me to my family, to my son, you know, to get clothes and food," said a mother receiving donations, who preferred to remain anonymous. The food bank provides almost a million pounds a year just to this one organization alone. "Without our partners in the community we could not do this work," Catholic Parish Outreach pantry director, Terry Foley said. "We served 121 families just in the three hours that we were open." Foley said that the number of people they serve here in Wake County has gone down over time, but there is still a huge need. "We were serving about 11,000 people a month during the recession and now they're down to around 9,000 people a month, she said. "So that's really good, but that's still a lot of folks we're having to serve groceries to. What we're seeing is that people who are coming to us are mostly in situational poverty," Foley said. Those are mostly people who now work lower-paying jobs, part time, or are simply not making enough to put food on the table - people like the mother we spoke to. "Food sometimes can be expensive, especially like if it's meat or you know, so that's a lot of help," the woman in need said. It's why dozens of volunteers here help out. "At the end of the day I go home tired," volunteer Willard Simms said. "But it's a good feeling, it's a good tired, and hopefully I can help some people during the day."